This hasn't really been a memorable week. Just another week of running. It is one of my higher mileage weeks at 41 miles, but neither my long run nor my tempo run was the longest I've done this training cycle. I do think this is the last 40+ mile week I'll run before the marathon. An empty parking lot is a sign of a crazy runner! 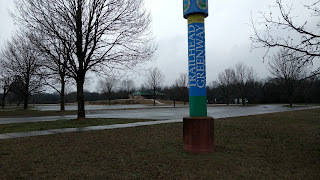 I hadn't been to the Murfreesboro Greenway in about 4 weeks, so I was happy to go there for my 16 miler. I parked near the General Bragg Trailhead. I ran up to the Stones River National Battlefield. 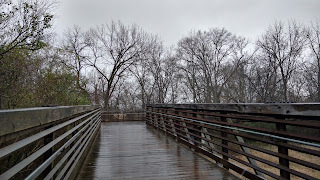 It had rained a bit during the past week and I wasn't sure about running the trail there, but when I checked it out, it was fine, so I ran the trail to the Visitor's Center. I love the visitor's center. Nice bathrooms, nice water fountain and open on Sunday AM. It rained on me for about a mile before I reached the visitor's center. At first it was just a light rain, but by the time I got there, it was raining pretty good. I was wearing my PreCip rain jacket, but I didn't have the hood up. I really should have stopped to get my hood up when it started raining. I put it up before I left the visitor's center, but I was already wet, which wasn't the best idea since I was only 5 miles into my run. I ran back through the battlefield back to the General Bragg Trailhead bathrooms for another quick break and a water refill. 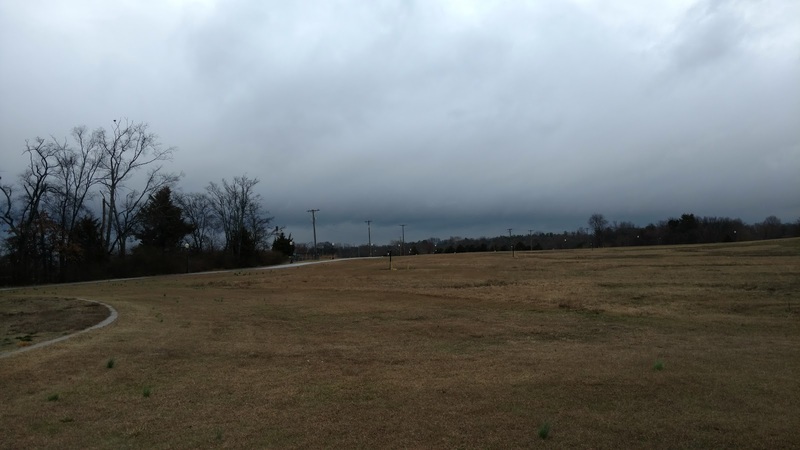 I should have stopped at my truck and switched out my wet half-zip for a tech T-shirt and a dry jacket to go under my PreCip jacket, but that didn't occur to me until I was done with the run, home and showered! Nice example of the brain just not kicking in sometimes. Then I ran through Gateway Island, pausing to see if their bathrooms were open. The water fountains were shut off, but the women's bathroom was open. I didn't use the facilities, I was just checking them out since I didn't realize there were bathrooms there. There are several geese and ducks that hang out at the Gateway Island water. 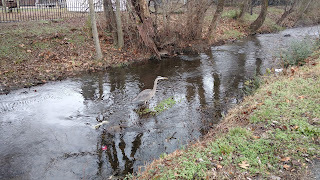 A goose was just a few feet off the path, so I slowed to a walk to get a look at him. I started to pull out my phone to get a picture when he began advancing toward me with his mouth open. I didn't know if he was begging for food or in an aggressive posture. I don't speak "geese." I decided I'd leave him alone and left without my picture. Slippery bridge! Can't tell in the pic, but it was sleeting at the time. I walked this bridge for safety. 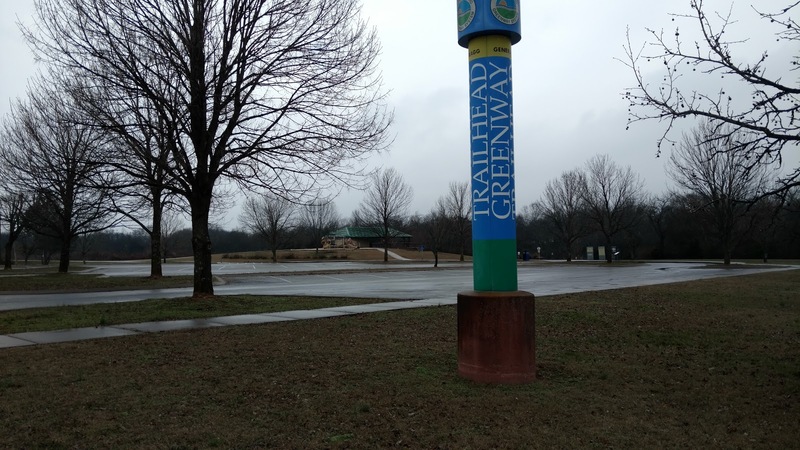 I ran out to Medical Center Parkway and hooked back into the Greenway at the Searcy Street Trailhead and continued south along the Greenway. I ran out to the Cannonsburgh Village Trailhead. They were shut up tight for the winter. I was pretty cold as the weather was rain, sleet or snow off and on. But I was enjoying looking at things along the trail, both nature and man-made. I did feel a bit crazy for being out there, but it was a good experience and taught me that I really should put my hood up sooner when it's raining in the winter! When I ended up at the Old Fort restrooms, I only had 3 more miles to go. I paused to refill my water bottle and make use of the facilities, then ran another 1/2 mile further south before turning around and heading back to my truck via the Fortress Rosecrans Trailhead and stayed on the Greenway all the way back. 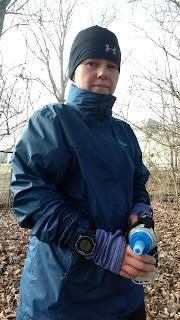 I did briefly consider extending the run to 18 miles, but I had been cold for the entire run and after my 22 miler a couple weeks before, I had nothing to prove to myself. Bundled up and still cold! Definitely a winding route, but fairly interesting. My last 4 miles were a struggle but I pushed myself to keep pace so much that my last 4 miles were 30-40 seconds per mile faster than my long run pace was supposed to be. I had 3 breaks that totaled 8 minutes 23 seconds. My average without the breaks was 13:13/mi. Adding in the break time, my average was 13:44/mi. I hope I won't stop so much in the actual marathon! I probably won't. My last 1/2 I didn't take a single pit stop break, although I wanted to, there just weren't any facilities after the 4 mile mark. This was a first thing in the morning run before work and breakfast. After how tight my legs were after the 16 miles, I thought I'd have more trouble, but other than just tired legs, it wasn't too bad. I did grumble and complain during the entire 4 miles. Not a good run from a mental perspective, but physically, it was fine. 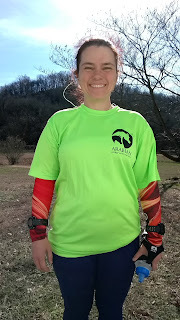 Me in a bright shirt since I ran on the road. I haven't actually done a specific hill run for almost 2 months. This was for 2 reasons. I started having issues with my right hamstring brought on by too much uphill running too fast. And I started incorporating some elevation into my weekly long and tempo runs. My goal is to get at least 1000 ft of climb in a week of runs. Most of the time that ends up being during my long run or split between my long run and my tempo run. 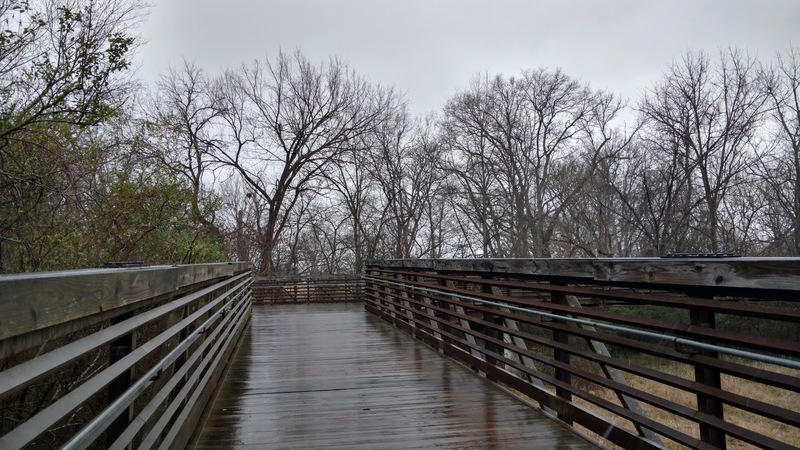 Running at the Nashville Stones River Greenway gives me some good elevation to work with and helps mimic, at least partially, the elevation I'll see at the marathon next month. 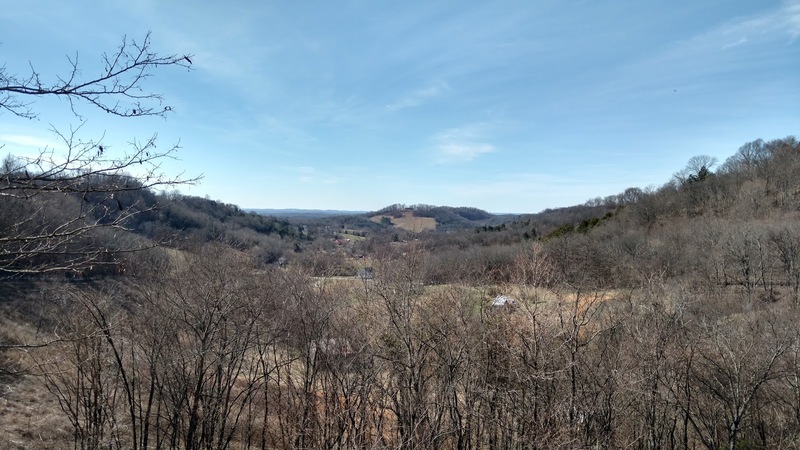 The Murfreesboro Greenway doesn't have much in the way of elevation change, so I needed something to bump my numbers, so back to the hill workout. This time I added a little more to my run to get a full 6 miles in. My last run of this route clocked in at 5.5 miles. This route runs up over a hill and down the other side. 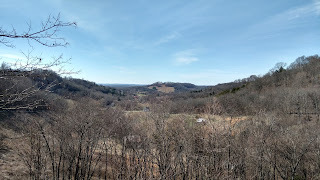 What I do is turn around at the bottom on the other side and run up the hill, and just keep running the same side of the hill until I get my mileage in and then finish up and go back. So the route, except for about 1/4 mile at the start/finish is all up or down. I ended up climbing the hill 4 1/2 times. I'm still being careful of my hamstrings and building up really slowly, so I only did short 15 second run 45 seconds walk intervals up one of the hills. All the other uphill was walking. So my average pace was fairly low, even with jogging downhill. I was pretty tired for this run, so I didn't get as much of a pace boost from running downhill as I usually do. As a side note, I wore my marathon shoes for this run. I've been training my long and tempo runs in a blue pair of Altra Paradigm 2 shoes. Those now have some 180 miles on them, including my 22 miler from a couple weeks ago. I have a purple pair of the same model that have 60 miles on them now and those are the shoes I'll wear on the marathon. I just wanted to be sure there was nothing funky about them and they still will work for the marathon. This was my tempo run. I went super early to River Park to run a loop down to Smith Park and back via Raintree Parkway and Crockett Park. I did the same run last week, but this time I actually made the turn off Green Hill Blvd correctly, so didn't add an extra mile to my run. If I skip the stop at Smith Park, I can make it a 10 miler, but I like the rest stop at Smith Park to refill my water bottle and use the restroom. Means I don't have to carry my larger water bottle, I can make do with my Nathan soft flask. This was another cold run at 38° with a cold breeze. Running to Smith Park, the wind was at my back. I was wearing my UA half zip and my PreCip jacket. I also had inknburn arm sleeves on under my half zip. Running with the wind at my back, I was a little warm, so I had my half zip completely unzipped and my PreCip jacket unzipped half-way. 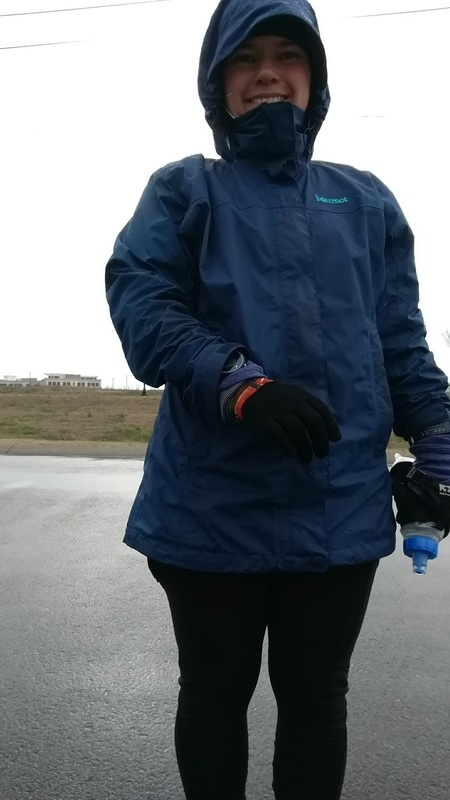 I was regretting bringing the PreCip jacket, but when I started running into the wind after my Smith Park break, I was so happy I had it. I zipped everything back up and was fairly comfortable for the entire run. My tempo runs this past month or so have been mostly negative splits with me running the last 3 or 4 miles 30-45 seconds faster than marathon pace. But I was tired for this run and screwed up my fueling so those 2 things resulted in not being able to push my pace. I usually eat a gel right before my run or in the first mile, but I didn't take my first gel until I'd gone almost 2 miles. Then I had 3 shot bloks at mile 4.5 and 3 more at mile 7. Then I didn't take another gel because I figured I was almost done, but I would have been better off taking one at mile 9, even with only 2 miles to go. I only had the one stop at Smith Park, but that was 90 seconds longer than it should have been. I just wasn't moving very fast overall. I did manage to maintain my pace when I was actually running. Every mile was at target pace or less than 10 seconds faster. It was just hard to keep churning out the miles. Fatigued legs. I could have gone further, but I was happy not to. I had a 12:22/mi average pace without the break. 12:51/mi average with. This was not a hard run. A little hard mentally getting through the first mile, but watching a show on Hulu made the time pass easier. I toyed with the idea of not running this easy run, but doing so would pop me over the 40 mile mark for the week and it's still a bit new to me to say I ran over 40 miles this week, so that was enough motivation to get me on the treadmill! Normally when I run outside, I listen to songs. I have a specific running playlist, but I subscribe to Google Play Music and I'll listen to various radio stations to pass the time and mix up what I hear. I only listen to stuff that my phone has downloaded on wi-fi, so it's not using up my cell data. This week, I decided to try a couple podcasts that I've never listened to before. On Sunday, during my long run, I listened to Embrace Running. This is a podcast by Mark and Elena. I got to listen to their 2016 goals wrap up and their 2017 new goals podcasts. I also got to hear a trail race recap. I quite enjoyed listening to them chat about running and fully intend to keep listening. On Thursday, during my tempo run, I listened to Tina Muir on the Runners Connect Run to the Top podcast. I got to listen to Tina interview triathlon coach Rob Wilby. This was a great intro to triathlons for runners. It "almost" made me want to try a triathlon. Almost. I also got to listen to Tina interview Hannah Smith, an amazing woman that beat cancer and runs and is training for a triathlon after having 2/3rds of her stomach and esophagus removed! Her outlook is amazing and inspirational. I highly recommend this particular podcast episode. All in all, definitely a success in listening to podcasts while running. Any others I should try? I would love recommendations. What a great question. What's next? I get to this portion of the post every week and I have to pause and think, really, what IS next? I get so focused on just the next workout and just this week that I really don't think about next week until I get here. Good thing I have a training schedule around here somewhere. I take a look at it and tweak it based on my previous performance. Looks like this week I have 5 days of running on the schedule. A lighter long run of only 10 or 12 miles and a tempo run of the same length. Then easy runs to round out my mileage.